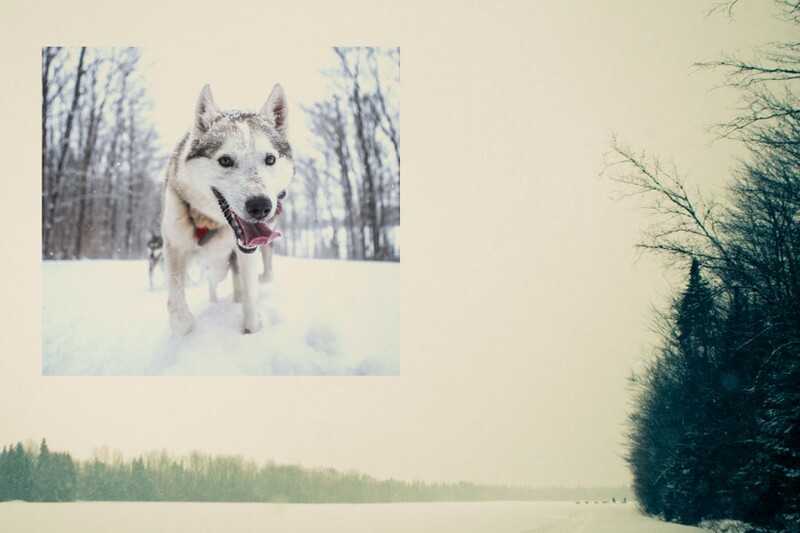 You’re bundled from head to toe, strolling on cobblestone walkways covered with a fresh blanket of snow. 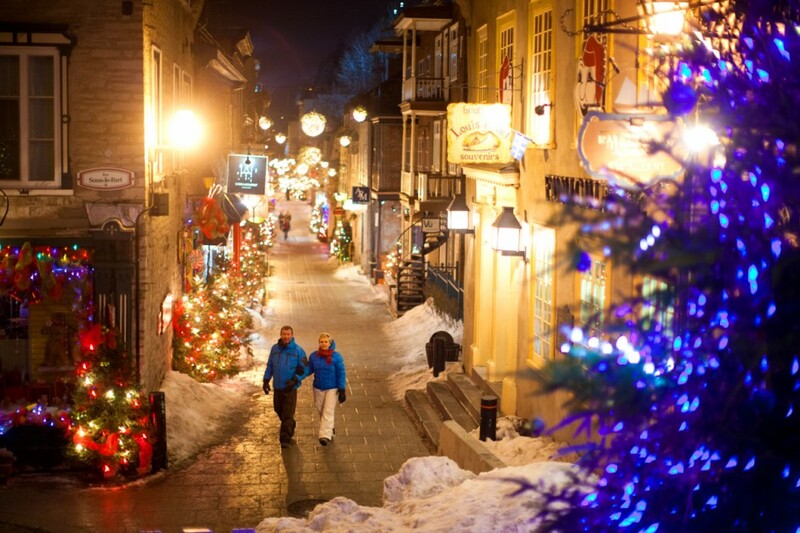 It’s damn cold, there’s no doubt about that, but you’re sipping on a hot cup of Caribou (a warm concoction of brandy, vodka, sherry, and port), which is doing more than enough to balance it out as you explore the very fairytalesque setting that is Quebec City in winter. For so many places in the northern latitudes, winter travel is an afterthought, if it’s considered at all. But I had serious trouble budgeting time during my trip to Quebec City to fit in everything that was available to me — from ice climbing to dog sledding to just walking around what has to be one of the most romantic cities I’ve ever visited. 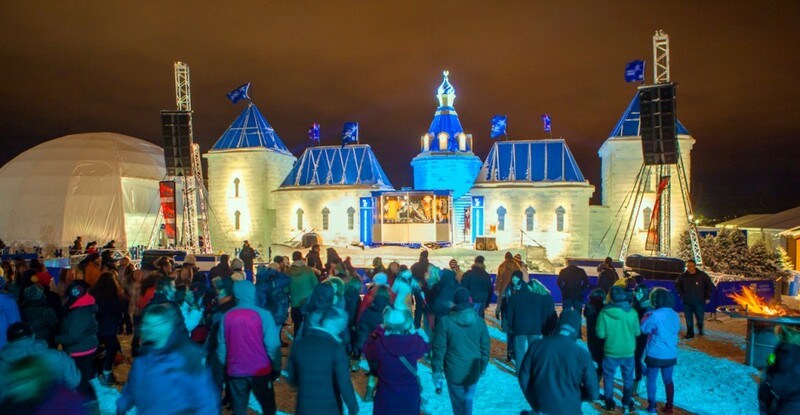 And if you time your trip right, you’ll be able to see the famous Quebec Winter Carnival and its palace made completely of ice. 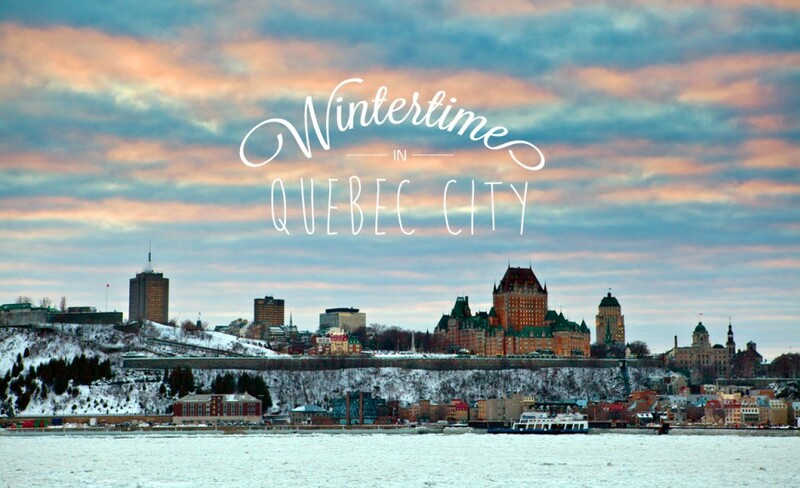 Check below for a sneak peek of wintertime in Quebec City. The view of Quebec city from across the Saint Lawrence River. The Château Frontenac, the building that dominates this scene, is a grand hotel perched above Old Quebec City and makes for a beautiful sight when you approach the city for the first time. 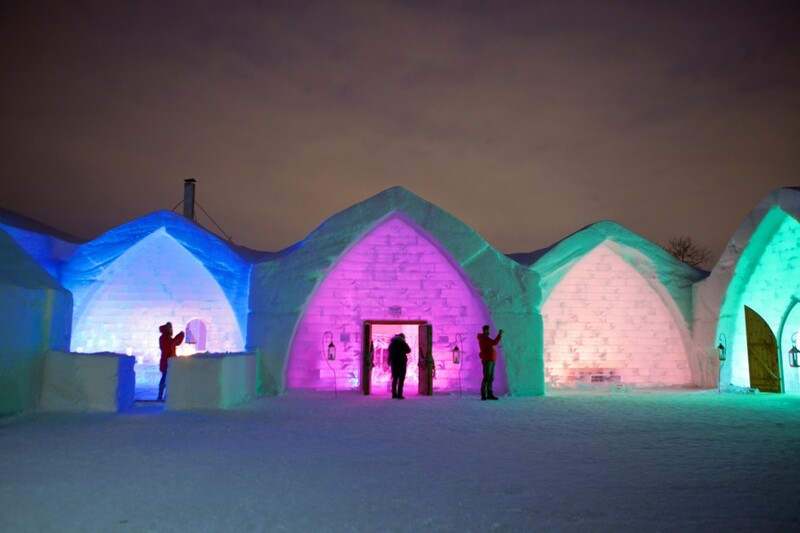 Hotel de Glace, located in the north of Quebec City, is the only true ice hotel in all of North America. 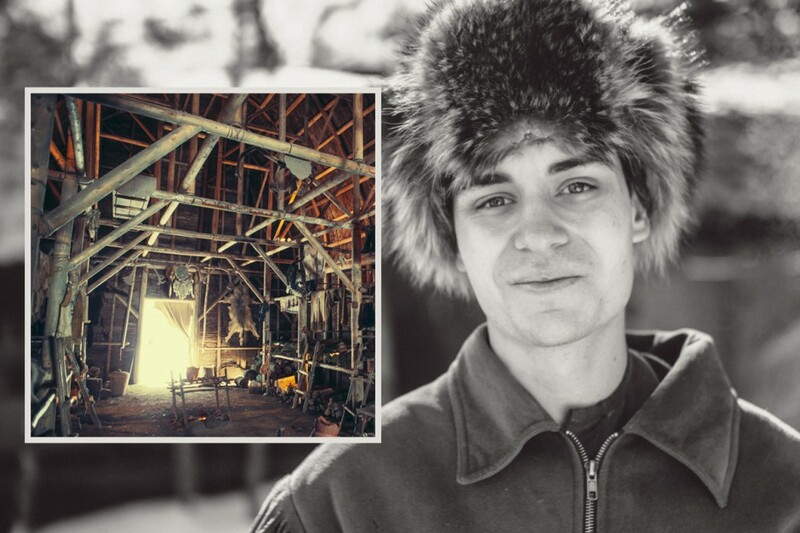 The answer is yes, it is as cold as it looks…but it’s a magical experience to step inside. 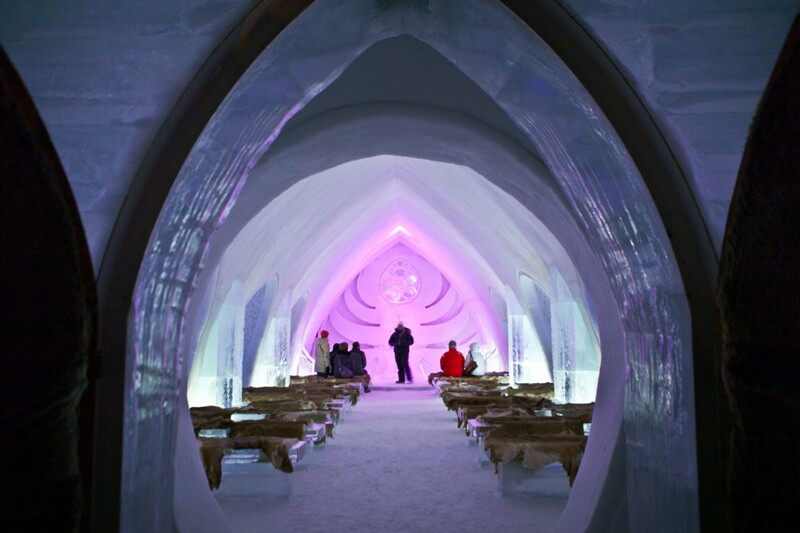 For those brave souls who don’t really worry about the cold, the Ice Hotel would be happy to host your wedding. There is a chapel on the grounds, where every year couples come to tie the knot. 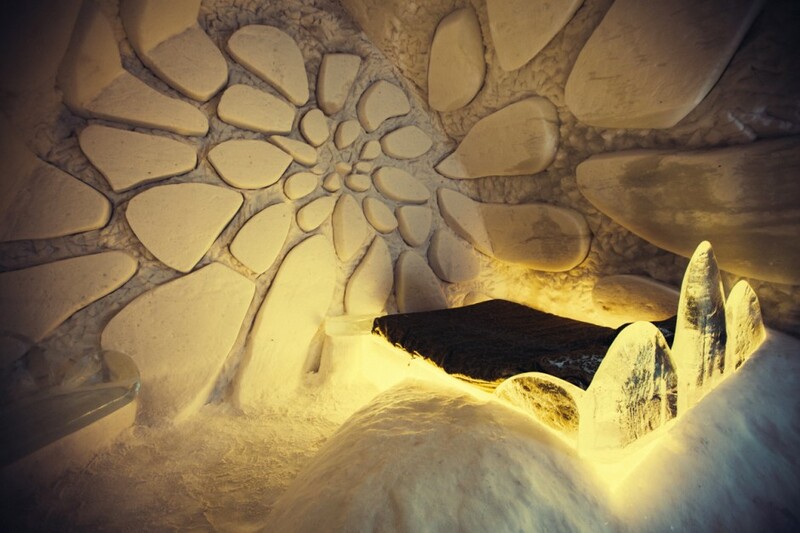 Each room in the hotel has one-of-a-kind ice sculptures carved directly into the wall. You’re going to need an extra blanket, but you can’t beat this for bedroom decor. Even the cocktail glasses in the hotel bar are made out of ice. The awesome thing about ice glasses is that once you’re done using them, you just throw them on the ground…true recycling. At Wendake, also north of downtown, is the Huron-Wendat Museum, dedicated to preserving important sites and cultural artifacts of the region's First Nations peoples. 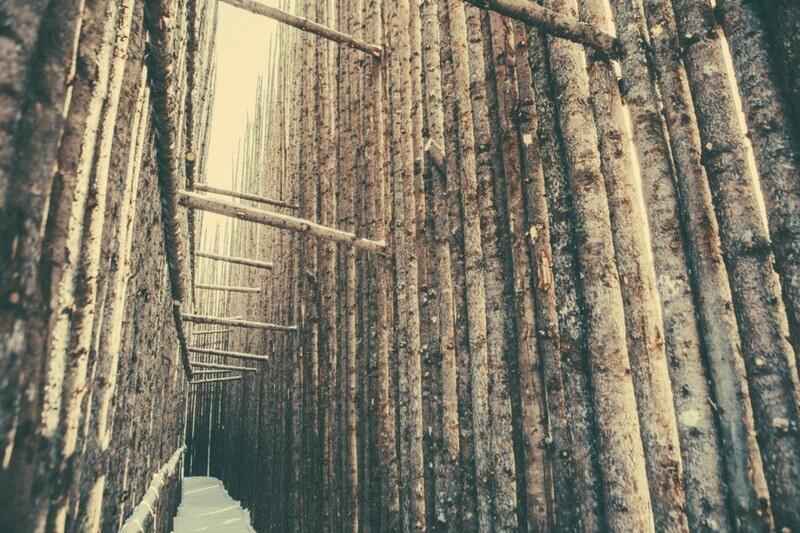 Pictured above is a traditional fence of the Huron-Wendat that was used to defend a longhouse. 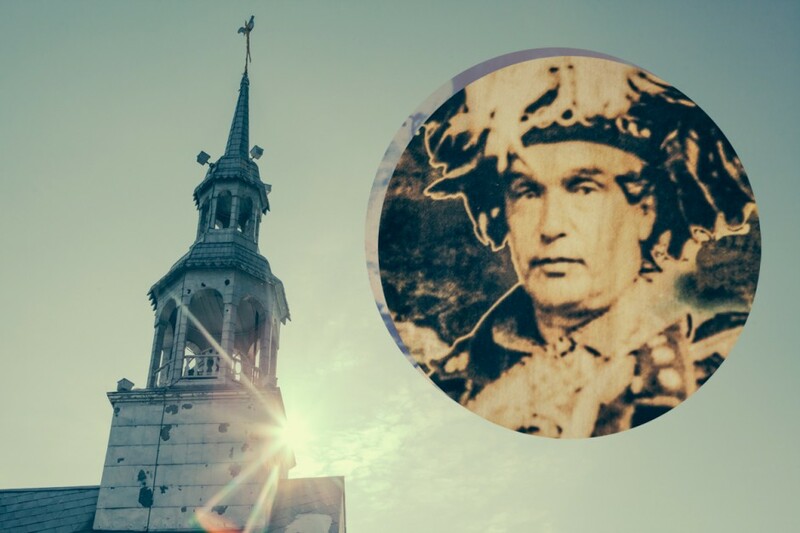 Notre-Dame-de-Lorette Church in historical Old Wendake, along with the inset image of one the last Grand Chiefs who lived in Tsawenhohi House. Construction of the original church on this site began in 1730. The interior of a traditional longhouse, along with an image of our guide from Site Traditionnel Huron Onhoüa Chetek8e, also in Wendake. 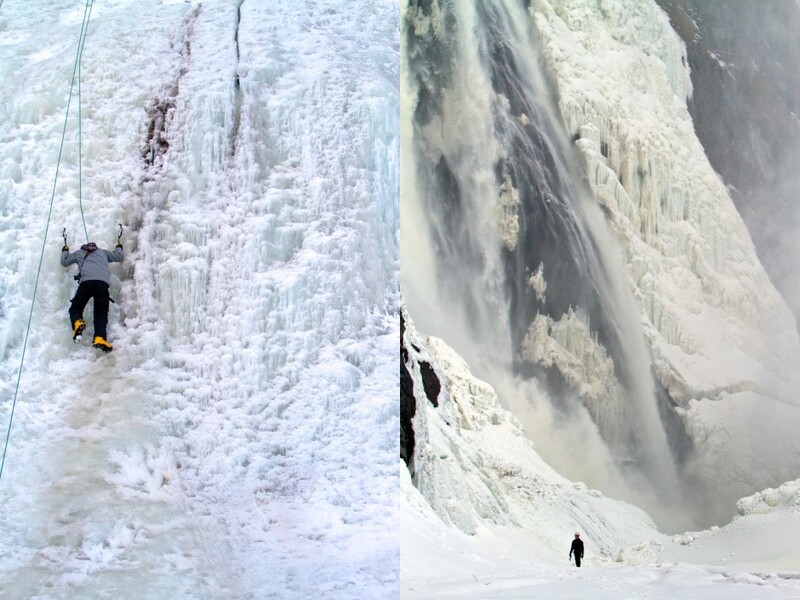 One way to get the blood flowing in freezing temperatures is to do a little ice climbing at Montmorency Falls, just a few minutes' drive from Old Quebec. We spent an entire day climbing up and down the falls. 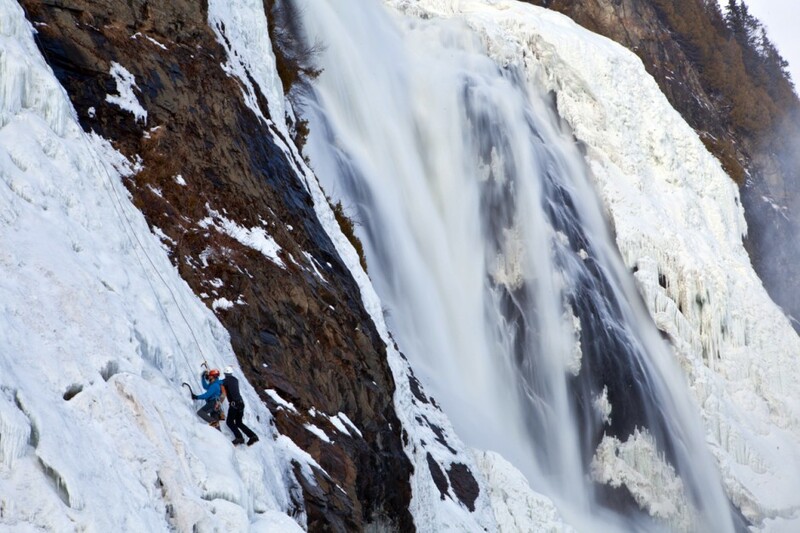 You don’t have to go all the way up, but there are a few who do dare to take on the impressive 275ft waterfall. Take a look at the image on the right -- this is about as determined a look as you will ever get out of Dylan Siggers, the Matador Ambassador that I was traveling with. I had to give it a go too. 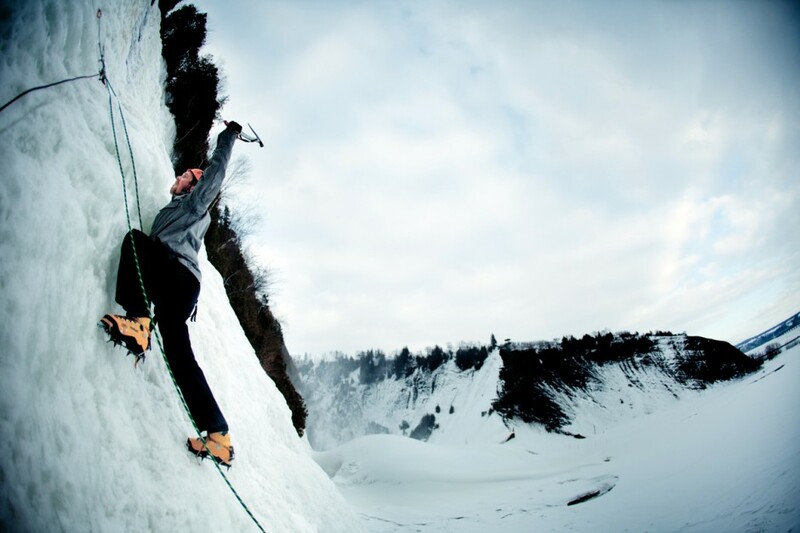 It was my first time ice climbing and definitely a foreign feeling putting all your weight into the front cleat of your crampon. 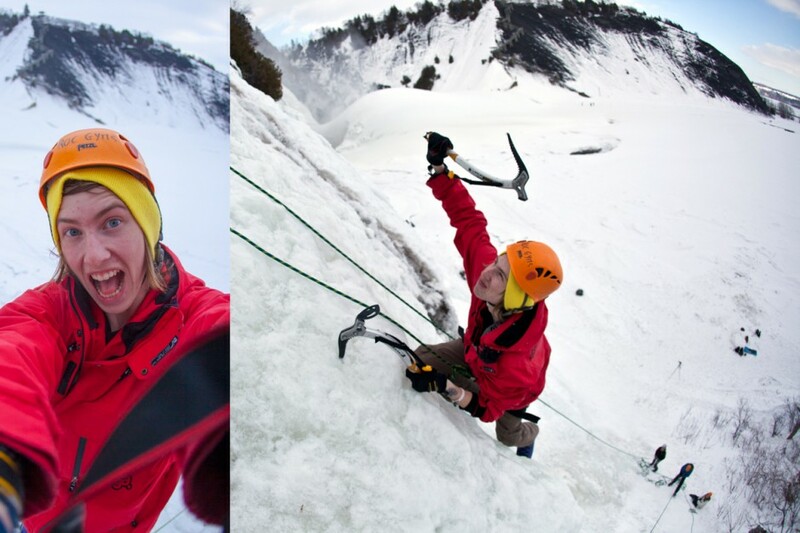 Even by the end of the day, I still wasn’t feeling the ice-pick/crampon combo -- not the usual for a California boy. You can take the Funiculaire, pictured at left, for a quick and fun ride up to the top of Quebec City. With snow on the ground, there are seemingly endless adventure opportunities right out of town. Snowmobiling was an obvious choice. Next, we learned that the art of ice fishing is known only to the most patient and resilient of people. 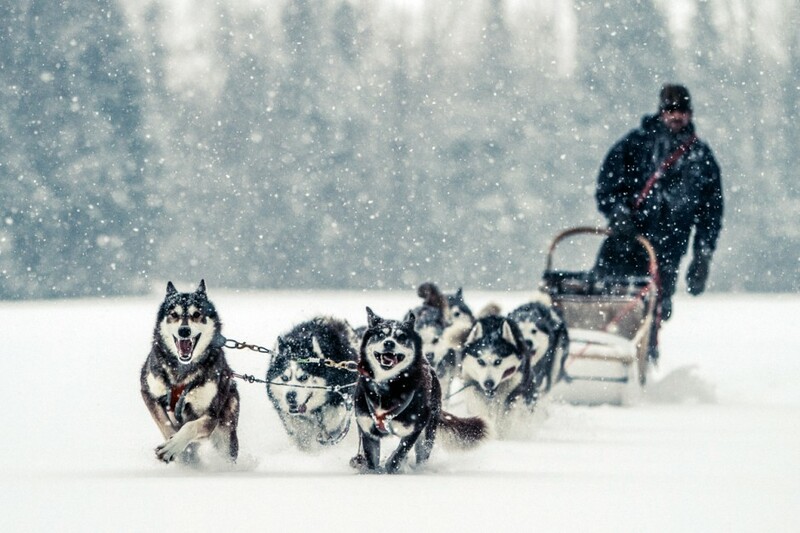 And finally, we got to go dog sledding, which was probably my favorite. I couldn't get over how adorable these dogs were. It’s pretty amazing seeing these creatures move in a full sprint in unison, and how you can tell they absolutely love it. 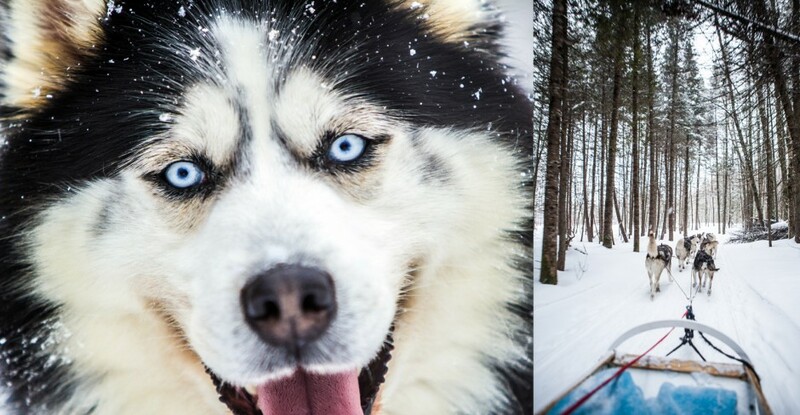 Iceberg blues and the view while leading your sled through the snow. 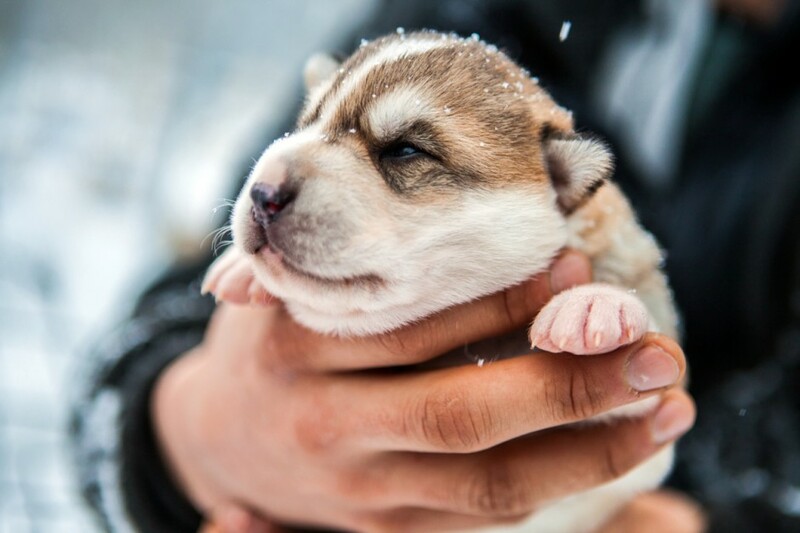 This little guy was only a week old and had been curled underneath his mother. A very important place to be when the temperature outside can dip to 30 below. 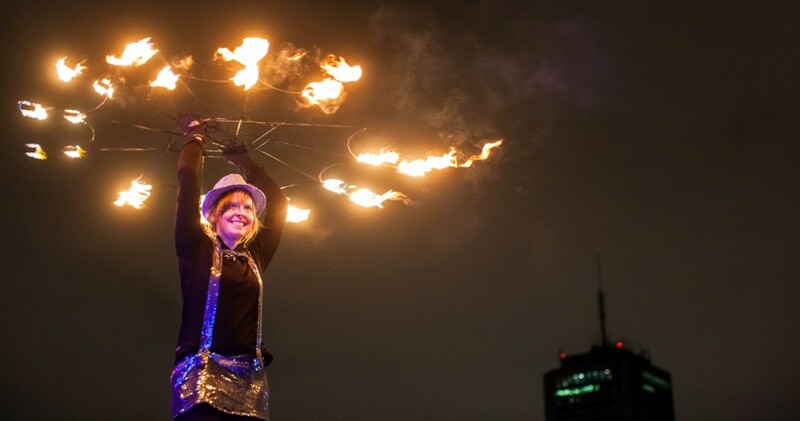 The Quebec Winter Carnival has been held every February since 1955. This is the Ice Palace, where we stumbled into a full-blown dance party. 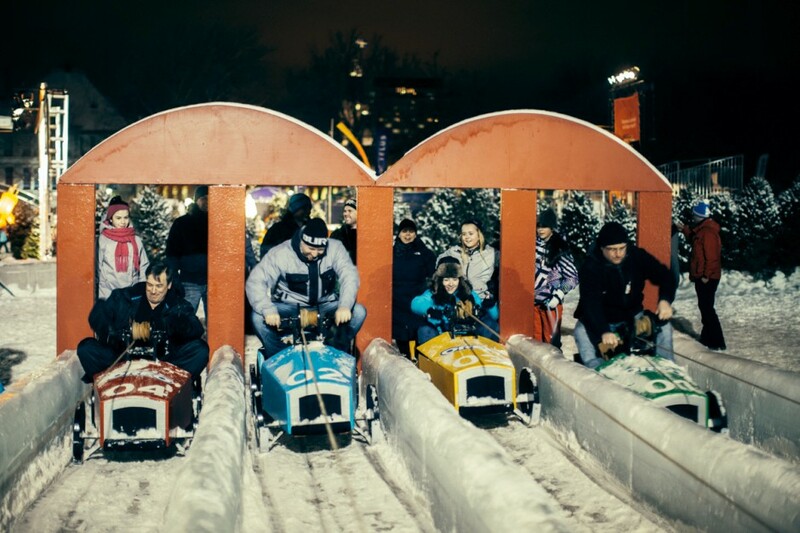 The Carnival hosts a number of activities: Sled rides, ice sculptures, skiing, snow rafting…if it has something to do with snow and racing, they probably have it. 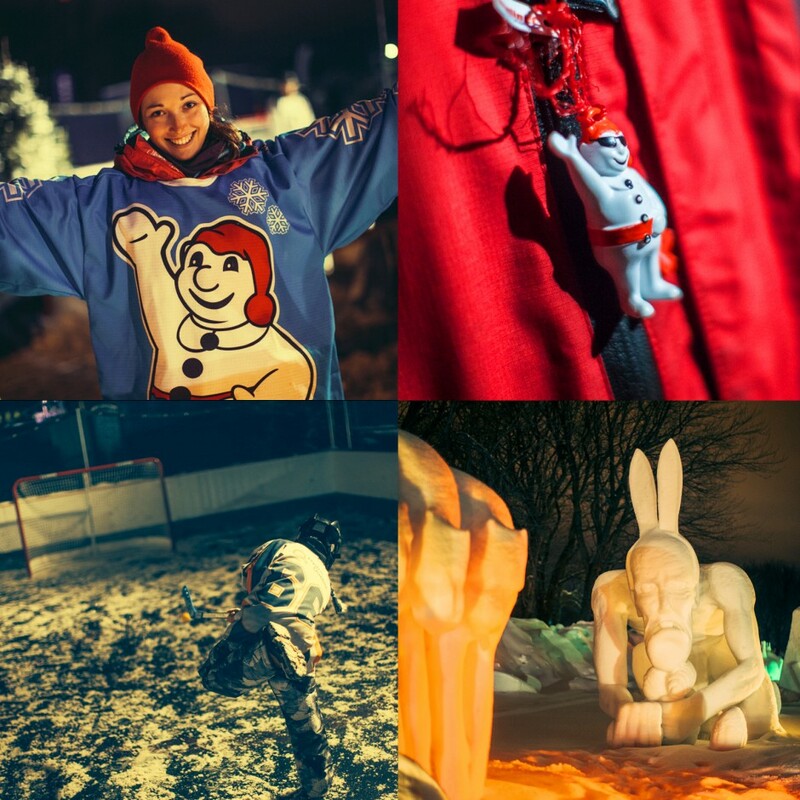 A small sampling of the good times to be had at Quebec Winter Carnival. This was my favorite treat of the trip. Warm maple syrup was poured directly onto a block of ice, and as it started to congeal, you would take a popsicle stick and roll the hardening syrup up into a little ball. Delicious.